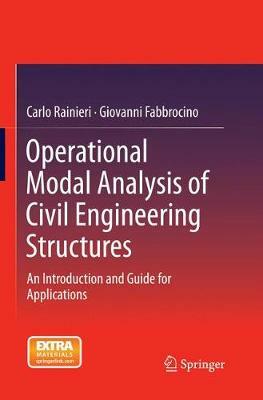 This book covers all aspects of operational modal analysis for civil engineering, from theoretical background to applications, including measurement hardware, software development, and data processing. In particular, this book provides an extensive description and discussion of OMA methods, their classification and relationship, and advantages and drawbacks. The authors cover both the well-established theoretical background of OMA methods and the most recent developments in the field, providing detailed examples to help the reader better understand the concepts and potentialities of the technique. Additional material is provided (data, software) to help practitioners and students become familiar with OMA. Covering a range of different aspects of OMA, always with the application in mind, the practical perspective adopted in this book makes it ideal for a wide range of readers from researchers to field engineers; graduate and undergraduate students; and technicians interested in structural dynamics, system identification, and Structural Health Monitoring.